'Kong Pia' or Guang Bing was invented by the hero General Ji Guang to solve the problem of his soldiers' food ration in their long marches during the Anti-Japanese Occupation War. The hole in the middle of the bread is so that the soldier can string them together for easy carriage; usually around their neck. The general's legacy has since been carried on to the present day by the overseas Foochows. Sibu is the home of Guang Bing in Malaysia and no food is as synonymous to the Foochow as the Guang Bing. 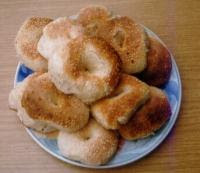 "Kong Pia" as is colloquially known, is baked in a tandoori- type oven and its texture is like that of a bagel. Best taken warm, it is a versatile bread which can be eaten as is, with meat, peanut butter and butter, preserved vegetable or whatever takes your fancy.. The Etor2000 riders and support crew will relive the original purpose of General Ji Guang with the added supplement of modern day invention in Power Bar and the likes. I am formally from Sibu and has been sear.ching for the recipe of kompian.